Half of this collection is currently stocked in Paris. Some extracts of the collection have been presented in Grenoble OUI art center in 2009, in Chicoutimi Bang art center in 2012 and on many occasions set at the Duplex100m2 Gallery. 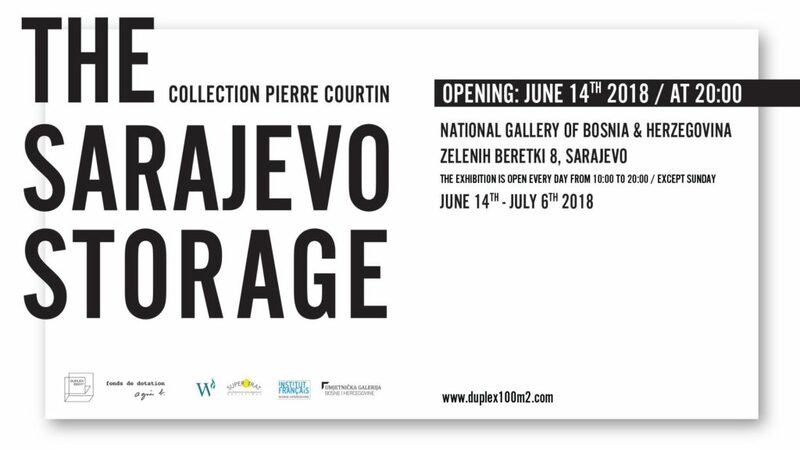 The exhibition inside the National Gallery of Bosnia & Herzegovina in June 2018, « Sarajevo Storage – Collection Pierre Courtin » present art works and objets kept in the depot in Sarajevo and essentially presents the works obtained within these five last years spent in Sarajevo. There can be found works testifying an affiliation or particular attachment to Bosnian capital, contemporary local scene, and a strong link with a history of Duplex100m2. The exhibition is supported by the Agnès b Fondation, the Superstrat N.G.O , the Warm Sarajevo festival, the French Institute in Sarajevo and the National Gallery of Bosnia & Herzegovina. Special thanks to Lucia Gigli, Jean-François Daoulas, Andrej Ðerković, Nina Knežević. I am not only interested in art; I am interested in the society where art is only one aspect. I am interested in the world as a whole where the society is only a part of it. I am interested in the universe where the world is only a fragment of it. I am interested primarily in the ongoing creation of which the universe is only a product. Amateur and professional art workers, who have never been tempted to take home a souvenir of an exhibition, an intervention in public space, a performance or concert? A subtle piece that will present a trace of a visual, sensory, aesthetic experience. Does owning these traces make us thieves? Sentimentalists? Collectors? Since 2001, Pierre Courtin (artist, gallery owner and collector) raises the question of the status and function of an art collection. Articulating works (films, drawings, photographs, paintings and sculptures) with fragments of works, materials (booklets, posters, cards) and other objects, he has established an unconventional collection. Driven by passion, curiosity and a willingness to share, Collection 10m2 does not express any intention towards market perspectives, but does not stay at the margins of the world. Today, the collection counts more than 300 pieces from the work of more than 200 artists. As an artist himself, he questions the process of gestures: gleaning, collecting, compiling artists’ works that he likes. As a gallery owner and collector, he raises questions on the articulation of pieces: their mobility, accessibility and visibility to a wider audience. The result of these searches, unexpected findings, encounters, trips, collaborations, is that the collection of Pierre Courtin consists of gifts, details, scraps, anecdotes which have over the years made up the memory of an experience both personal and collective. A collection should normally not only be the taste of its creators, but rather a direction in the history of polysemic art. Such collection becomes gradually the material and conceptual voice of a man, a woman, a collective. Pierre Courtin slips between preconceived ideas, norms and traditions, making fun of conventions by combining value scales. The concepts of hierarchy, reputation, career, and merchantability are not at all taken into account. Coming from European and international scenes, these works – fragments are a result of eclectic works of artists such as Joseh Beuys, Jusuf Hadžifejzović, Baptiste Debombourg, Adela Jušić, Robert Filliou, Radenko Milak, Jean-Luc Verna, Camille Laurelli, Ulay and Robert Smithson. The collection of Pierre Courtin reflects a particular and unique look at contemporary art. Through the work, its details and documentation, he offers us a different point of view of a piece of art he loves and defends. Since it does not correspond to any usual criteria, The Sarajevo Storage is extracted from commercial sector. In this sense, it appears as an anarchist island within the art world governed by money, standardization and compromises. Therefore, the collection, a “personal, emotional and sentimental utopia”, is lead by a commitment and manifests itself in: against time, against the current. In reviewing the work and its residues, Pierre Courtin circumvents these obstacles to build long-term (conceptual and poetic) strategy which is an alternative to art shows. The collection is thus based on a personal, critical and ironic discourse carried by a breathless system in which it does not recognize itself. I like what you guys are up too. This type of clever work and exposure! Keep up the superb works guys I've included you guys to blogroll.